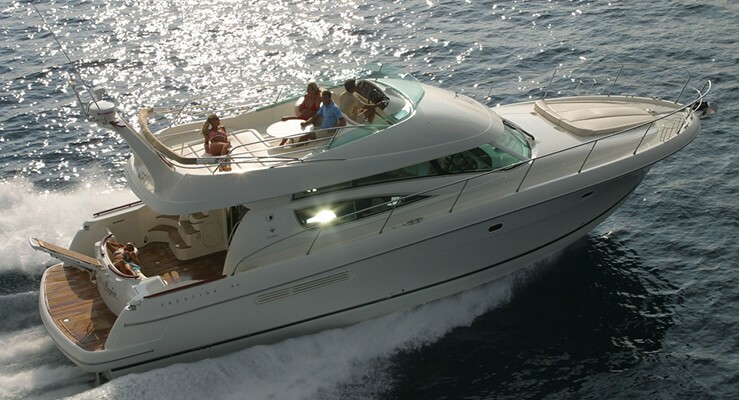 Jeanneau Prestige 46 is one of the finest motor yachts that can be rented in Croatia. This luxury yacht with fly bridge is equipped with two Cummins diesel engine brands, each of which has 500 horsepower with a solid axle. The biggest advantage of the Prestige 46 is it’s balanced hull, made from structurally reinforced fiberglass which provides excellent maritime effects of this boat. The inner space consists of three cabins with two beds with two separate heads with shower. In the stern there is a skipper’s cabin with a toilet in order to get as much privacy for the guests. The interior is made from lacquered mahogany ant the whole interior is covered with luxurious carpet. Choose same yacht model from other base on Adriatic and please contact us for the price.